At the start of the game, Cheesemancer gains the ability of a random creature from Isle of Madness. Cheesemancer is an epic Neutral creature card. When Cheesemancer takes damage, she deals that much damage to you. Your opponent can't target Cheesemancer with actions. 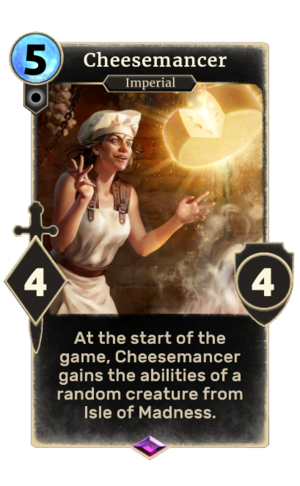 A playset of premium Cheesemancer cards was available during the Festival of Madness on day 29 and 30 for 2,000 gold as part of the Isle of Madness Sneak Peek Pack. Before the release of Isle of Madness, it couldn't be soul-summoned, instead showing the message "Available only at the whim of Sheogorath". This page was last modified on 27 January 2019, at 14:23.